The Health Centre is committed to delivering professional and confidential services to assist you with your wellness needs. Continuity of care is extremely important to us. We do our best to accommodate everyone to ensure consistency between appointments and physicians . Our services do not replace the services of your family physician as they will have a better understanding of your medical history. If you have a family physician in the Lethbridge area, we encourage you to attempt to make an appointment with them prior to booking an appointment at the U of L Health Centre. We are pleased to offer a diverse team of physicians, psychiatrist, nurses, and administrative staff to provide a wide range of services. We are committed to provide a caring and confidential environment. As such, the U of L Health Centre collects personal information that is necessary to operate clinical/mental health services and manage the health care for those students who visit the Health Centre. Personal information collected at this health care facility is used to manage health care services, such as physician/psychiatrist visits, generation of laboratory test reports, program statistics, billing, etc. In addition to information collected under the general authority, the Alberta Health Care Insurance Act authorizes the collection of the individual’s Alberta Health Care Insurance number or its equivalent for billing purposes. Collection of personal information by health practitioners and confidentiality of clinical records are also subject to the provisions of the Alberta Health Disciplines Act, Health Facilities Review Act, Medical Professions Act and Health Information Act. Our program collects basic statistics about the services we provide. We will make every effort to protect your privacy. However, like other service providers, we may be legally required to report or share information. Examples are if a child is at risk or if you were intending to hurt yourself or others. For further information about personal information collected by the U of L Health Centre, contact the Associate Vice President, Human Resources and Administration: 403-329-2276. Medical records are kept completely separate from your academic records. We retain your records for 10 years, from the date of the last appointment. After this period of time your chart is destroyed. Medical records may also be used for descriptive research purposes, once all identification has been removed. Treatment records are for the use of physicians, psychiatrists, psychologists or recognized professional or para-professionals only. Patients are not authorized to view their own records, but can authorize similarly qualified professionals to access these records on their behalf. Complete the Consent to Release Form and fax it to the HC at 403-329-2466 or email it to health.centre@uleth.ca. We will then provided a copy of your records to the said professional. A copying fee may be charged for this service, if the chart is extensive. Should you desire to apply for an Alberta Health Care Card or need to update your personal information linked to your card you may do so here. International students are requested to visit the Health Centre for assistance with their application. Injuries or near miss events must be reported to Risk and Safety Services by completing a Campus Accident/Injury Report wtihin 24 hours of the event. In Canada, basic health care coverage is provided by provincal health care plans. All University students MUST have basic health insurance. Alberta Health Care Insurance Plan will cover the cost of your doctor's bills, hospital bills, surgery and medical tests. While you are attending school in Alberta you may contunue to use your current provincal health care card from another Canadian province. We can assist you in applying for Alberta Health Care should you not currently have any basic provincal health care insurance. International students need to come by the Health Centre and we will assist you in applying for health care coverage. It is very important to ALWAYS carry your provincal health care card with you. This card in necessary for you to access any and all health care services. Please ensure that you have your card and photo ID with you. 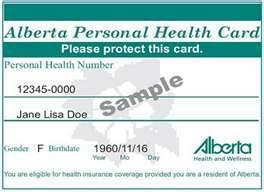 Should you require a new card contact Alberta Health & Wellness toll-free in Alberta 403-310-0000 then 780-427-1432. This plan pays for medical costs not covered by Alberta Health Care, i.e., ambulance, medication, dental work, etc. The costs for this plan are included in your tuition. You will be automatically enrolled in the Students' Union Extended Health and Dental Plan if you are a full-time student. Please contact the Students' Union Office in SU180 for more information on your Health and Dental Plan or to opt out if you already have other another extend benifits package. To have health insurance like Canadians, you will have need to have two plans that work together. All University students MUST have “basic” health insurance. Alberta Health Care Insurance Plan will cover the cost of your doctor's bills, hospital bills, surgery and medical tests. If you do not have home travel health insurance and are in Canada for over one year, you must have this plan. You can have a travel health insurance plan from your home country or province. The Health Centre will need to see an English translation of your coverage to make sure you have enough coverage to protect you from large medical bills. If you are staying for more than a year, enrolling in the Alberta Health Care Insurance Plan is usually less expensive than purchasing a costly travel Insurance plan in your own country. If you are staying for less than one year, the Alberta Health Car Insurance Plan will not be available to you. The Health Centre has an excellent short term plan available to students. Call the Health Centre at 403.329.2484 ext 2 or drop by SU 020. This plan pays for medical costs not covered by Alberta Health Care, i.e., ambulance, medication, dental work, etc. The costs for this plan are included in your tuition. You will be automatically enrolled in the Students' Union Extended Health and Dental Plan if you are a full-time student. This plan is not available for EAP students. The Board of Governors of the University of Lethbridge requires all International Visa students to have health insurance while they are students here. Contact us to make an appointment- it is best to call us first. Illness notes are a courtesy that the University of Lethbridge Health Centre can provide for students. If your illness is one where we instruct you to stay at home to recover (such as diarrhea or certain viral illnesses) you may obtain your medical note upon your return to campus. Note that it is still your responsibility to email the instructor and let them know of your illness. 1-Day Illness - If you are ill and know that your require a note for your missed classes/academic situation, call the Health Centre on the date of your illness. We do not provide notes for illnesses not seen or discussed by our staff. Long-Term Illness - In a situation where your illness is long term, you must immediately contact your advisor to make a plan for your situation. This may include contacting the Health Centre for your health concerns and talking to your Professors. Mental Health - Illnesses, including anxiety, grief, depression. Large Scale Communicable Disease - (such as mumps and H1N1) The U of L has made extraordinary efforts to ensure academically continuity for students. Should a campus-wide event occur, please follow specific instructions on protecting your academic record that would be up around campus on TV screens, noticeboard, posters, etc. Chronic Illness - Any student with a chronic illness should be seen at the Health Centre (by one of our Nurses) within the first month of school or when diagnosed with a long-term illness. The procedure for illness notes in this situation will be explained to you when you come talk to the nurses. Work Notes - Most clinics charge for any notes given for school or work. As our Health Centre deals with the illness first and notes are secondary, we seldom (but yes occasionally) charge for notes for work. Each professor and teacher should have information for you on their syllabus on how they want you to deal with illness while you are attending their class. Some classroom situations do not absolutely require your attendance at each class therefore no note is required; other situations may be have marks associated with attendance and notes may be mandatory. When you return to the classroom you must provide your professor with your illness note. Be sure to retain a copy for your own records.